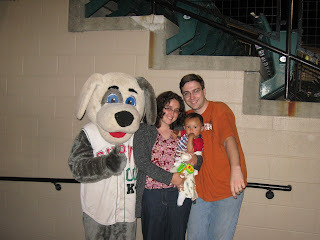 Last night we took Aaron to his first baseball game. 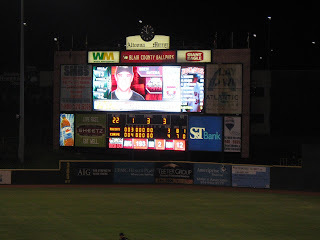 We have a local minor league team and so we did a full night including the food and game. It rained before and after the game but was very nice for the actual game it was nice. The final score was 4 to 3 for Curve. One of the mascots...Diesel Dawg. The team is the curve named after the Horseshoe Curve. SO the the mascots are named after train actives. The other mascot is Steamer a green smoke stack. 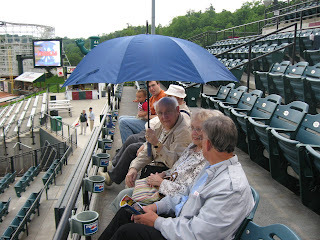 Another special part was that Grandpa Graffius was there with his brother Uncle Weston and his wife Carol. 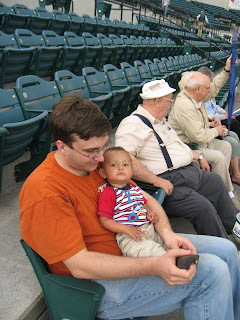 So there was 4 generations at the ball game. A very enjoyable evening Aaron stayed up past bedtime. how fun! wish we could have been there! Yes, how fun! I wish I could have been there, too!